UNHCR Head of Office on Lesvos, Astrid Castelein, prepares to give blood for International Blood Donor’s Day, 14 June. UNHCR, the UN Refugee Agency, have taken part in a three-day blood drive on Greece’s Lesvos Island to mark International Blood Donor’s Day (14 June). 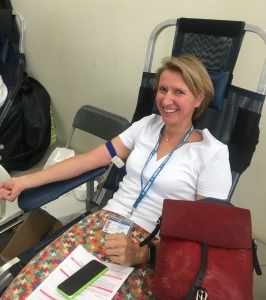 More than 250 people donated blood between Tuesday and Thursday, including six UNHCR staff and 15 other humanitarian workers. Lesvos has the highest levels in Greece of Mediterranean anaemia, known as Beta Thalassemia, and requires up to 4,500 blood units per year for transfusions. The Lesvos Blood Donors Association, which organised this year’s campaign, collects a third of the needed blood units each year. UNHCR supported the blood drive with cleaning materials, text message invitations to registered donors, and promotional activities. Lesvos medical workers used 117 blood units in life-saving interventions for refugees and migrants in 2015, the most recent year with available statistics.